We love these pillows! They are very well made. The cording is sturdy and bold. The down inserts make for comfortable lounging. We think they ate the perfect pop for our boat! 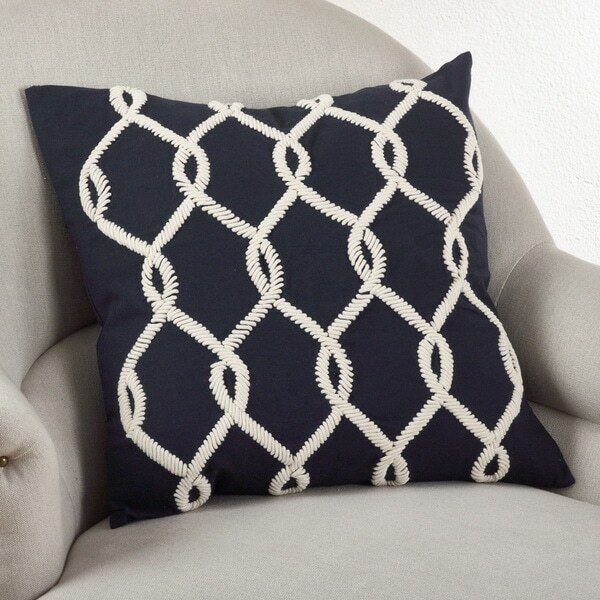 Dress up any room with this decorative embroidered cord design pillow. This cotton pillow adds vibrancy to any room and is perfect for everyday home decor. Duck feather pillow inserts included. Dimensions 20.0 In. X 20.0 In. X 4.0 In. The rope detailing is lighter in person than it appears online. Not too formal to be used everyday. Great quality and craftsmanship. We thought we found just what we were looking for, but are returning due to the color difference in person versus online. Shipping was also delayed longer than expected delivery date.